This is a great way to share this important exhibition with book workers across the country who won't be able to attend. If you are attending the exhibition, would like to get published, and are willing to write a casual review, please respond to southeastguild@gmail.com. Above: Kathryn Clark with Paper mould. The Robert C. Williams Paper Museum at Georgia Tech in Atlanta, Georgia is proud to present Twinrocker: Forty Years of Hand Papermaking September 23, 2010 through December 17, 2010. The opening reception will be at the Museum on Thursday evening, September 23, from 5:00pm to 7:00pm. Twinrocker Paper Mill founders Kathryn and Howard Clark will attend. Parking is ample, free, and secure. When we think of great moments in history, we think of big events: the fall of the Berlin Wall, the first moon landing, the discovery of Penicillin. There are many more great moments, however, that are unknown to most of the world, yet they quietly change certain industries and even the way we live. Such was the founding of Twinrocker paper mill near Brookston, Indiana in 1971. 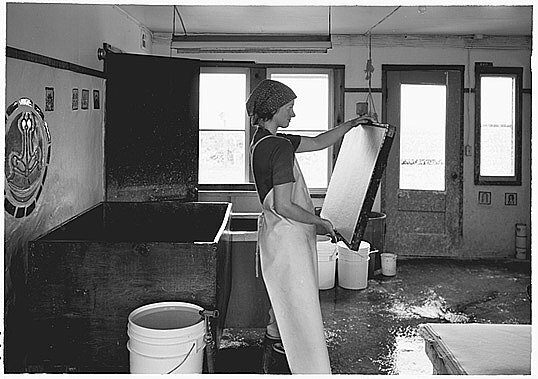 The impact that Twinrocker's founders, Kathryn and Howard Clark, have had on hand papermaking in the United States and the process of creating Fine Arts Books over the past four decades will be celebrated in a 40th anniversary exhibit at the Museum. Twinrocker: Forty Years of Hand Papermaking will mark the first time this collection has ever been on public view. Over the years, Twinrocker papers have appeared in the portfolios of some of American's most important artists and fine limited edition book publishers. The exhibit will include a number of these first edition fine art books, each a work of art in itself. Among the artists represented in the exhibit are Robert Rauschenberg, Sally Mann, Louise Bourgeois, Jasper Johns, Jim Dine, Chuck Close, Willem de Kooning and Larry Rivers and others. A number of photos of the papermakers at work throughout the history of Twinrocker will be included. Twinrocker: Forty Years of Hand Papermaking will trace the evolution of Twinrocker from the early years to the present. It's the story of rediscovering an almost-lost American craft, as well as the story of an enduring partnership and a small Midwestern business that triumphed through the Clarks' hard work, tenacity and talent. Text and image above are from the Robert C. Williams Paper Museum website. to create the best possible papers for conservators and artists. Our website has information about the other classes: making a Hollander beater using materials from the hardware store; pulp painting; using Hanji to make wearable art; itajime for paper decorating, pulp spraying; making clay molds for paper casting, making a book with a photographic narrative, and miniature books. President, Friends of Dard Hunter, Inc.